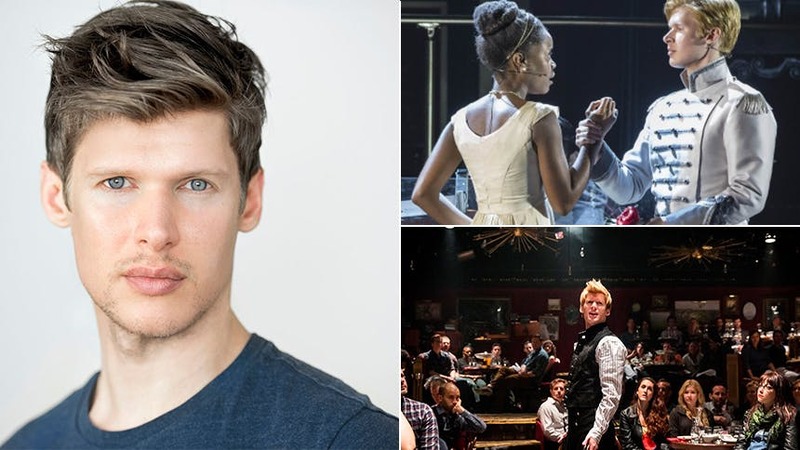 A decade after making his debut in The Threepenny Opera, Lucas Steele is back on Broadway giving a breakout performance as the hot Russian heartbreaker Anatole in the hit musical Natasha, Pierre & The Great Comet of 1812. He's been with the show its entire lifetime, and his performance already won him Lortel Award in 2014 for Outstanding Featured Actor in a Musical. BroadwayBox caught up with Steele to talk about the marathon of The Great Comet, how Anatole fills every room he's in, and his smaller moments with co-star Amber Gray. 1. What’s your pre-show like at The Great Comet? My pre-show routine is largely a process that assures I am prepared to handle the specific physical demands of the piece. As is the case with most shows, once the train leaves the station, there is no going back. This is especially the case with our 'marathon' known as The Great Comet. I have a series of exercises that activate my core strength, while also getting the muscles in my legs and glutes firing in a way that is more conducive to musculoskeletal health. I know, I sound like a text book! I've just learned over the years that the biggest obstacle to pulling off this piece is being able to navigate the set. Furthermore, rolling out my legs is an absolute must, before and after every performance. What helps you tap into Anatole? David Bowie. Freddie Mercury. Fred Astaire. Gene Kelly. A blow dryer. A touch of pomade. Most importantly, not giving a flying *#?!. 2. There is so much to see in this production and staging. Tell me one small moment you love that audiences might miss if they aren’t looking for it. Pretty much any glance I make to Helene (Anatole's sister) played by Amber Gray is a moment I treasure. She and I have developed a visual short hand over the years that speaks volumes sans words. 3. Having originated this role off-Broadway, reprised it at the A.R.T., and now bringing it to Broadway, what’s the biggest way your Anatole has changed or grown? I've always 'built' Anatole to fit the size of the room. He is completely strange and unnatural, but with that said, he MUST function in an organic way. How many audience member this 'plays' to has always been crucial to informing the characterization. He is a man who must be able to 'fill' the room at a moments notice. He started out filling a room of 85 people; now he fills a room of 1,200. As a result, his physicality has gotten slightly larger, but again, you can't overstep the line (into 'acting' a physicality) because in the eyes of the people sitting two feet away from you, this will undoubtedly turn into farce. To me, it's about how much energy I am driving through the space via cells and molecules. Knowing there are people sitting in the last row of the mezzanine activates more synthesis via my communication as an actor. I've also played with his voice, which similarly, has always been influenced by the size and feel of the room(s) we have played. Off-Broadway (at Ars Nova and Kazino) I went for a messier sound that was based more in 70's and 80's rock. Much more in the nose, more rough around the edges. As the size of the show increased, his voice had to do so as well, so I've opened him up a bit and brought him into a more rounded sound. Personally, I liked him rough around the edges, but the tastes of commercial theater (pertaining to vocal production) are a tricky thing to negotiate. 4. What did your years focusing on music and your time in Europe teach you about yourself? That period of time was invaluable to my evolution as an artist. Because the process was more than just an album, I was forced to utilize skill sets I had never called upon. It's a very interesting moment when you realize you are functioning as the conceiver, book writer, songwriter, music producer, marketing consultant and lead artist of a project. It was extremely overwhelming, yet completely necessary for me to realize my worth—especially as a writer. That I am capable of doing anything I put my mind to, it's just a matter of focus. Summoning the discipline and energy to devote time to that focus is the core challenge of my artistic life. 5. What’s your ideal day off like? Ideally, a private jet to a private island in the Keys. With that said, I settle for pajamas, television, and food. Don't miss Lucas Steele as Anatole in 'Natasha, Pierre & The Great Comet of 1812' at Broadway's Imperial Theatre. Hot Clip of the Day: Feel the Love with This Stunning Rendition of Fun Home's "Ring of Keys"